Enough people have commented that they have come by the shop and peeked in the windows, but we were closed. 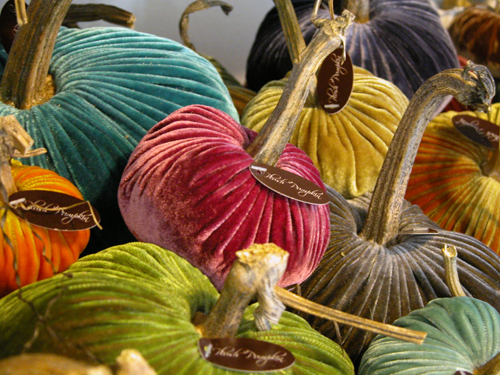 So beginning this weekend we will be open on Saturdays and what better way to start it off than with the arrival of the velvet pumpkins! This will be our fourth year to carry the pumpkins and along with the old favorites, are the new colors of turquoise, smoky topaz, coral and slate. We often have requests for shipping the pumpkins and are happy to oblige—just give us a call as the inventory changes quickly.